The SIOS Protection Suite Microsoft IIS Recovery Kit has two recovery procedures. For system or NIC failures, the Recovery Kit transfers the affected web server’s IP address to a standby system, and then starts up the standby web server. If there is a communication or startup failure, and local recovery is enabled, the SIOS Protection Suite Microsoft IIS Recovery Kit will first stop and restart the affected web server locally to see if that corrects the problem. If the restart is unsuccessful, then the Recovery Kit transfers service to the backup web server. The SIOS Protection Suite Microsoft IIS Recovery Kit manages the dependencies between the IIS application, IP and volume resources. First, you create the IP and volume resources to be used by your web servers. Then, when you create the IIS resource, the SIOS Protection Suite Microsoft IIS Recovery Kit reads the Microsoft IIS configuration and automatically creates the required dependencies between the IIS resource and the IP and volume resources. The following is a sample IIS hierarchy as shown in the LifeKeeper GUI. 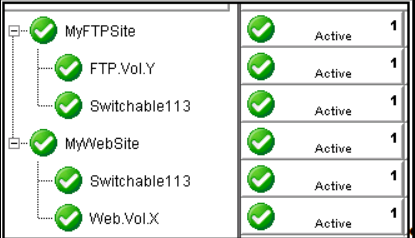 The Web site has dependencies on both the IP address “Switchable113”, and on the volume “WEB.Vol.X”, where the home directory containing the Web site’s content resides. Both the IP and volume resources were created prior to the web site creation.